Do you like Fidget Spinner High Score? Share it with your friends. Fidget Spinner High Score is a very catchy recreation game from the popular series of idle games dedicated to the latest world phenomenon of today, a small plastic propeller with a middle bearing called Fidget Spinner. 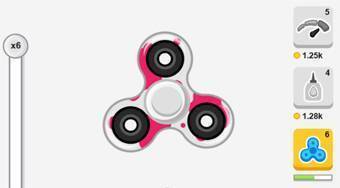 Turn this anti-stress toy as fast as you can, get money, and then buy upgrades and new looks for your spinner.